In a previous entry, I mentioned Reverend John Rankin, a man who had led a long anti-slavery career and life and I decided to do a post on him and his life's work. It took me quite a while to research, write and organize it, but here it finally is and I hope these few paragraphs do justice to his life-long efforts to end slavery. John Rankin was born in Jefferson County, Tennessee on February 4, 1793, to Richard and Jane Rankin. http://www.reverendjohnrankin.org/biography, (I just found that this link no longer works) John credited his mother for being especially influential in his moral development, as she voiced opposition to vices such as whiskey, tobacco, Free Masonry and dancing while placing a special emphasis on the evils of slavery. The ongoing Second Great Awakening may have influenced his family life and upbringing. John furthered his studies at nearby Washington College, where he learned under abolitionist Reverend Samuel Doak. He studied subjects like Greek, history and theology, among others and graduated in 1816. He married Jean Lowry, who was Reverend Doak's granddaughter and an active church member. John and Jean did not wish to remain in the slave state of Tennessee (at least partially because his anti-slavery views were unpopular and led some people to encourage him to leave the state if he planned to continue expressing them) so, taking their first-born child with them, they left the state in 1817. They settled in north-central Kentucky, where John took a preaching job at Concord Presbyterian Church in Carlisle (Nicholas County.) Slavery was legal here, but this church strongly opposed the peculiar institution and had joined other churches in an abolition society. The church and its new preacher were a good fit for each other as he began preaching here and in other nearby towns. He also started a school for slaves. Despite this anti-slavery sentiment John found, pro-slavery opinions were also strong in this area of the border state and, similarly to when he left Tennessee, slavery supporters made his life uncomfortable enough to convince him to leave, after having forced his school to move between buildings several times before it failed. Financial issues, especially trouble in collecting his pay from the church, also contributed to his decision to head north. In 1822, the Rankins finally moved to a free state when John accepted a preaching job in the Ohio town of Ripley, located along the Ohio River across from Kentucky and about 50 miles southeast of Cincinnati. (Including the new branch of the church he later helped form, he kept this preaching job in Ripley for over 40 years.) After living near the river for a few years, John bought a new house on higher ground with a view overlooking the river and the Kentucky shore. Here he continued his preaching career as the higher location and better view aided his work as part of the Underground Railroad. He signalled runaway slaves when it was safe to cross the river with a light (such as a candle or lantern) in a window or on a flag pole. He hid the fugitives until they could move or be moved further north, especially after the stronger Fugitive Slave Law passed in 1850. According to Ohio History Central, he (and his family, which included nine sons and four daughters) aided perhaps 2,000 runaways, with his sons often taking the fugitives from his house to safer places farther north. His work also served as one of the inspirations for Harriet Beecher Stowe's Uncle Tom's Cabin. Ohio was a free state, but was close enough to the slave state of Kentucky that he became well-known to slave owners. A bounty was placed on his head, and owners of runaway slaves often came to his house searching for fugitives or information on where they might be. In 1824, John discovered that his own brother Thomas had become a slaveholder in Virginia. This displeased John, who wrote a series of letters to his brother. These letters were published serially in a local newspaper at first but soon came out in book format, entitled Letters on American Slavery, which became an influential early anti-slavery work, espousing the need for immediate emancipation. (The letters also helped persuade Thomas to get rid of his slaves. He later moved to Ohio.) This publication helped make Rankin more well-known nationally for his abolitionist views. John was one of the founders of Ripley College (which I have seen described as a Presbyterian Academy) in 1829; the school admitted its first African-American student just two years later. One of its students possibly was Hiram Ulysses Grant, from nearby Georgetown, who may have attended it for one year before enrolling at West Point and becoming Ulysses S. Grant. In the late 1840s, while continuing his work with fugitive slaves, he helped form a new branch of the Presbyterian Church, the Free Presbyterian Church of America (or Free Presbyterian Church Synod of the United States. Please forgive me for resorting to a Wikipedia link, but it does list sources. I have seen both names used for the new organization.) This new branch of the church opposed slavery and the admission of slaveowners to the church. He also joined and led other organizations, such as the American Reform Tract and Book Society, a group dedicated to anti-slavery religious teachings and publications. He served as President of this group, as my previous post showed. When the Civil War began, the Rankin family remained active in the fight against slavery as six of John's sons and one of his grandsons fought in and survived the conflict. The Rankin family's work, along with that of another member of the Underground Railroad, John Parker, and other figures in the city (along with the town's location so close to a slave state) helped Ripley become an important point on the Underground Railroad, one through which many escaping slaves found their way to freedom in the North or Canada. According to this site, one of Confederate General John Hunt Morgan's goals in his 1863 raid of Indiana and Ohio was to "attack the hell-hole of Ripley." Morgan and his men neared the town, but did not actually reach it. Rankin's decades of fighting slavery made him one of the more famous abolitionists in the country and influenced other well-known slavery opponents. One of these was Henry Ward Beecher. A story I have seen here and at other websites says that after the Civil War, someone asked Beecher who abolished slavery and his response was "The Reverend John Rankin and his sons did it." Another was Wendell Lloyd Garrison. According to the New World Encyclopedia, "Garrison credited Reverend John Rankin of Ohio as a primary influence on his career, calling him his "anti-slavery father" and saying that Rankin's "book on slavery was the cause of my entering the anti-slavery conflict." John Rankin died on March 12, 1886 at age 93 and was buried in Maplewood Cemetery in Ripley, alongside his wife Jean who had died in 1878. His house still stands as a museum and National Historic Landmark in Ripley. 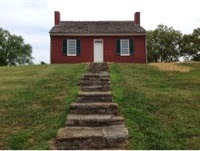 See the site's website or Facebook page for more information on the house and its important inhabitant. Here is a list of sources I used and consulted in late 2014 and early 2015 (others are linked inside the post). There are many other links if you search John Rankin on your favorite search engine. Many have similar info, some with other details. The website http://www.reverendjohnrankin.org is working. 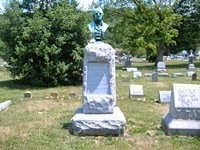 Great resource for biografic informaton as well as abolionist community ties in Ripley, Ohio. For a very well-researched treatment of the subject, Ann Hagedorn's book 'Beyond the River' is outstanding.